With every Operating System that Windows releases, it always tries to add innovative features that don’t make users feel bored. It either enhances old features or introduces new productive features. We are sure that seeing the same thing can get drab and boring over time and one such thing is the font type. Every Operating System that Windows releases have a default font type. However, with the passage of time users tend to get bored and want to have a change. Thanks to Windows 10 which lets its user’s experience change by providing them the ability to change the default font type. The default font for Windows 10 is Segoe UI. However, you can easily change it with the easy steps provided in the article. The method of changing the default font involves making changes in the registry. Registry is the most important part of an Operating System and modifying it is a risky task, as any changes done can cause serious damage to your computer. It is always advised to take a full backup and create a system restore point before making any changes in the registry. From Control Panel search for Fonts and click on it to open. The Fonts panel displays all the fonts that are available on your Operating System i.e. Windows 10. From here you can choose which font you wish to set as a default font. Some of the types are Verdana, Arial etc. It is suggested not to type the code to prevent any typing errors. Once this is done, replace “ENTER-NEW-FONT-NAME” with the font you want. This field contains the type of font you want to set the default text as. In this article, we are taking the font type as Arial. Once finished click on File from the menu bar. Here tap on Save As. Now, from the drop-down menu of Save as type click on All Files. Post this give a name to your file. While naming the file make sure you append .reg extension in the end. So, the filename should look like “default-font.reg”. After you have saved the file double click on it to merge the file into the registry and then click Yes. Lastly, restart your PC for the changes to take effect. After the PC restarts, you must have the default font as Arial. It is always advised to set font types that are easy to avoid any confusions. 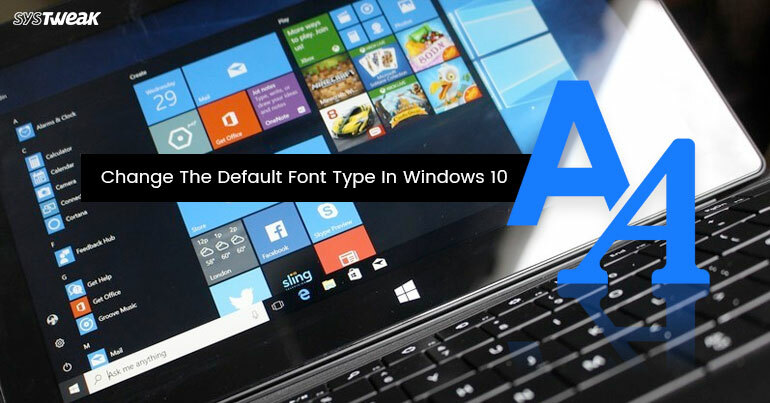 So, folks, there were the steps you can use to change that default font type of Windows 10 Operating System.